Established in the year 2003, We Isha Engineering & Co. have made a mark in the industry as one of the foremost Manufacturer and Exporter of engineering products such as Hydraulic Scissor Lifts, Hydraulic Lift, Movable Hydraulic Scissor Lift, Material Handling Lift and many more. Under the profound supervision of our mentor Mr. S. Ganesan, we have been growing at rapid pace and offering products that conform to the established industry standards. Our firm works with an aim of aligning our manufacturing practices with the globally accepted production practices, with special emphasis on R&;D. In addition to this, we adopt standardized procedures for executing the tasks, which assist our experts in delivering unparalleled results. We are encompassed with an enthusiastic team of engineers and professionals, who have stood beside us and have enabled us in delivering precision engineered equipment. With our honest and transparent organizational processes, we have achieved a large customer base. Over the period, we have also established ourselves as an OEM for supplying various earth moving, defense, automobile, industrial and construction equipments. 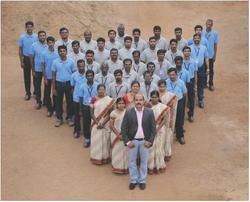 Our company has achieved wide reputation through adamant approach of our mentor Mr. S. Ganesan (CEO). His effective managing and marketing skills have enabled us to maintain long-term tenure with our clients by providing transparency at all discreet level of productions and clients dealings.